Such is my axis in the Theater of Space-Time: On this mid-January day of 2017, Donald J. Trump has just been sworn in as the 45th President of United States, to the uneasy consternation of every Mexican I know, whether they consider themselves on the political left, center, or right. Mexico City’s smog feels more miasmic for the resentful confusion, a sense of a new knife descending on old scars, impending chaos. From my desk here in the southern suburb of Coyoacán, beyond my neighbors’ flat-roofs and water tanks, through a break in the clutter of jacarandas and shaggy-headed palms, I can sometimes glimpse the lava dome known as the Ajusco. I treasure my view—this dinosaur’s spine—not because it is spectacular, but for the chance, rare outside of a skyscraper, to rest my gaze on such a luxury of distance. Today I can make out only a pale blear. But after wind sweeps the sky, many a time I have seen the Ajusco in crispest of outlines, glowing an orange-ashy-rose worthy of Maxfield Parrish, and all dusted with snow. On my desk sits another luxury of distance, the English translation of the 1542 Relación (report) by the conquistador whom I have come to think of, fondly, no disrespect intended, as Mr. A. Cow Head—because that was his name: Álvar Nuñez Cabeza de Vaca. A would-be conquistador of Florida, Cabeza de Vaca was serving as treasurer for the expedition that set out from the island of Cuba in 1528—this was only seven years after the conquest of Mexico. They shipwrecked. Most of the men drowned, starved, perished of exposure, or were, at one point or another in their hideous odyssey out of Florida, killed by Indians. In what is today an area of East Texas, Cabeza de Vaca was enslaved for eight brutal years. When he finally escaped, he joined with the remaining survivors, two Spaniards and a Moor, and led them, wandering in what he hoped was a direction that would take them to the outposts of the Spanish colony. From the details of his description, we know that Cabeza de Vaca reached La Junta, where the Río Conchos and the Río Grande flow together on what is now the US-Mexico border at Presidio, Texas and Ojinaga, Chihuahua. Everyone who has written about Cabeza de Vaca has his or her pet theory about the rest of his itinerary, but all agree that he zigzagged west across the pitiless expanse of what are today portions of northern Coahuila, Chihuahua, and Texas. Cabeza de Vaca stayed in Mexico City-Tenochtitlán for two months. More likely than not, he would have made the day’s journey south to Coyoacán. Had he walked, or perhaps, with more dignity, ridden a horse over the patch of, presumably, cornfields where my house now stands—and he may well have—his view of the Ajusco would have been, unlike mine, spectacular. And the air, for him, so fresh yet musky with the perfume of wood fires and gardens. Massive as the Ajusco may be, it is but one bead in the necklace of volcanoes around Mexico City. The sheared-off cone of Xitle (pronounced sheet-leh), boiled up from beneath the Ajusco’s north-facing slope into a fist of lava some 1,700 years ago—culminating in the eruption that destroyed Cuicuilco—the Pompeii of the New World—vomiting down a nearly 30-square-mile-wide bed of soot-black lava. This is known to us as El Pedregal, the stony place. I do not know what the Aztecs called the Pedregal. For what it’s worth, the Spanish-Nahuátl dictionary I Googled up online translates pedegral as tetlan. When Xitle blew, the ancestors of the Aztecs would have been hunting and gathering in lands possibly north of present-day Wyoming—assuming, as linguistic evidence suggests, that the Aztecs descended from the same stock as the Shoshone and Comanche. In Frida Kahlo’s lifetime much of this remained a wasteland, as can be seen in her 1952 painting hanging in Coyoacán’s Casa Azul, Paisaje del Pedregal (Landscape of the Pedregral). 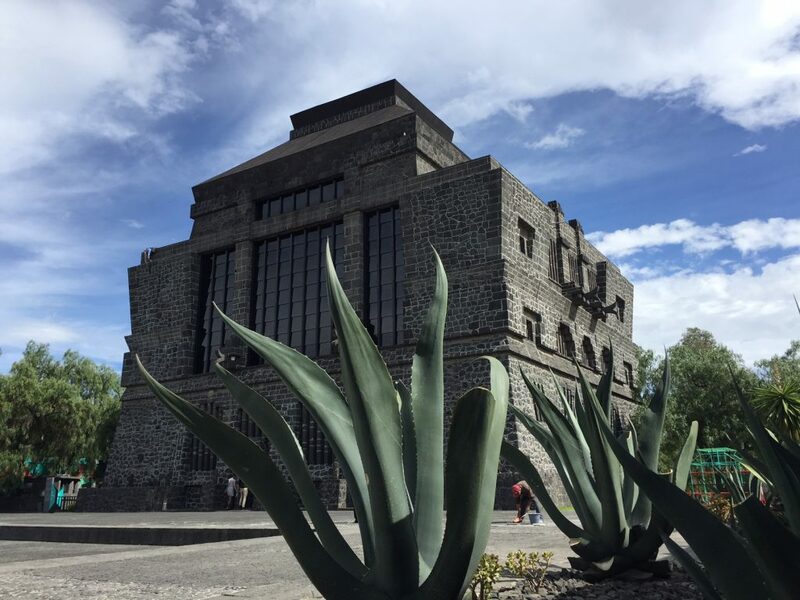 Kahlo’s husband, the great muralist Diego Rivera, understood that the Pedegral was destined, like Lake Texcoco, to disappear beneath Mexico City. When he donated his personal museum of prehispanic art, housed in his indigenous- and Frank Lloyd Wright-inspired Anahuacalli (Nahuátl for “House of the Valley of Mexico”), which was built in Coyoacán on the outer reach of the Pedregal, Rivera stipulated that the surrounding acreage be left in its original state. And it has been. With the press of Mexico City all around, Anahuacalli’s Espacio Ecológico feels larger than it is. Here and there, shivering the breeze, trees perch on the rocks. And cacti, tufts of grass, many mice and ants. Flies, bees, butterflies, and above the drone of traffic, birdsong. When I arrived in Mexico City in the mid-1980’s, most of the Pedregal was long built over with the Universidad Nacional Autónoma de México, housing developments, including an upscale suburb of avant-garde mansions, shopping malls, churches, schools, parking lots—although the ring road, or Periférico, licks past the excavated base of the great circular pyramid of Cuicuilco. Then as now, if you know where to look, here and there, whether in the Espacio Ecológico or on the extensive grounds of the university, or some unlikely spot, say, between a sidewalk and the front wall of a house, you might spy a wild swirl or pocked buttress of Xitle’s black spew. Cabeza de Vaca says nothing about the Pedregal in his Relación. But it would have been impossible for him to have missed it. It could be seen from many hilltops, from rooftops and miradors, all across the valley, that sun-baked and rattlesnake-infested Stygian immensity. So much is missing from his Relación. But I must, as must we all, be grateful that Cabeza de Vaca troubled to write it, and as generously as he did, and that it had the fortune to be granted a royal license to be printed, and that, squeezed through the bottlenecks of centuries, it survives—and not only behind the bolted and fireproof doors of Special Collections, but in easy-to-find paperback editions of all kinds, including translations, such as this one on my desk, published by the University of Nebraska Press in 2003, The Narrative of Cabeza de Vaca. Surely the author would have been astounded to know that this reader would find this edition in Marfa, Texas, then carry it home in a suitcase stuffed into the belly of a machine that, with a ferocious thundering, would soar above the clouds to Mexico City. And you, privileged reader, may view a facsimile of the stupendously rare second edition of 1555 for free, courtesy of the Southwestern Writers Collection at the Texas State University San Marcos, at this link. Unique, larded with wonders, and as terrible a tale as it tells, like all books, Cabeza de Vaca’s Relación is a magical object. But you already know that this is precisely what a book can do. You also know, although it is rarely put this way, that books enable us to catch and hurl packages of thought from a consciousness at one axis of space-time to multiple others. “Ca quemaca ca nehoatl.” Yes, it is me, says Moctezuma in the Florentine Codex. So says Mr. A. Cow Head to you in his Relación that, as I write these lines, is but 25 years from its 500th anniversary—half a millennium on this earth. Wherever and whenever you read this, that is to say, wherever and whenever you direct your eyes, to absorb into your consciousness these sigils we call, ho hum, “writing,” his words bounce to life in your mind. Papelito habla, the little piece of paper speaks, said some of the awe-struck indigenous. Papelito habla, say the Mexicans today, usually sardonically, in reference to a contract. Note: This is an excerpt from Dispatch from the Sister Republic or, Papelito Habla, a longer work on the Mexican literary landscape forthcoming from Dancing Chiva later this year.